Zambia is a fairly large landlocked country in Southern central Africa. Besides 12 million people it hosts some stunning landscapes, particularly the Victoria falls (named by David Livingstone), often counted in the “seven natural wonders of the world”. Zambia used to be a part of United Kingdom until it gained independence in 1964. While English remains the official language, over 80 different languages are spoken in Zambia. The economy of the country has been largely based on copper mining. The Zambian cuisine is based on maize, eaten daily as a a thick porridge called nshima, usually with vegetables, beans, meat, fish or sour milk. If the Wikia Recipes Wiki is to be believed, the Zambians even have a word for boredom caused by having eaten nshima with the same accompaniments for four days in a row, ichintendo. Another popular porridge is bambara, made with rice, peanut butter and sugar. Peanuts in general are important in the Zambian cuisine, as are sorghum, finger millet, cassava, pumpkin and squash, bananas, sweet potatoes, peas, cowpeas, cucumber, cabbage, chili, various greens and the wild-growing chinaka tuber. Food is often prepared by fire – roasted, grilled or baked in the ashes – or steamed in banana or corn leaves. This recipe sounded very good, with a lovely combination of spices, though the instructions and even the ingredients were quite unclear. The ingredients read “6 cardamom seeds” (I have halved the recipe), I assume this means seed pods, not six individual seeds… Nonetheless, the result was a very tasty curry. There are many different kinds of mock chicken, made of soy and/or gluten. The Chinese also make a frozen “chicken-style tofu”, which I don’t like that much, but its very spongy structure absorbs flavour well and thus might work well here. You could just use ordinary tofu, frozen and thawed, or even TVP chunks. I used an Asian mock chicken that was made with both seitan and tofu, but like most gluten mock meats the flavour did not penetrate well. As for the yoghurt, you can use storebought soy yoghurt – but why, when you can make your own? Bring a few cups of water to boil and cook the sweet potato, unpeeled, in it for about 10 minutes. Roast the butternut squash at 200C for 10-15 minutes (I find it is a real nuisance to peel otherwise…). Fry the “chicken” in oil until browned. Remove from the pan. Fry the onions in oil until golden, then add tomatoes, garlic, ginger, cardamom and curry powder. Fry for a few more minutes, then add the “chicken”, the stock and the lemongrass. Cover and simmer for 10 minutes. While the “chicken” is cooking, fry the sweet potato and the butternut squash in a separate pan until browned and crisp on the outside. Add the chili to the “chicken” gravy and cook for two minutes. Add the yoghurt, stir and heat through, but do not allow to boil. 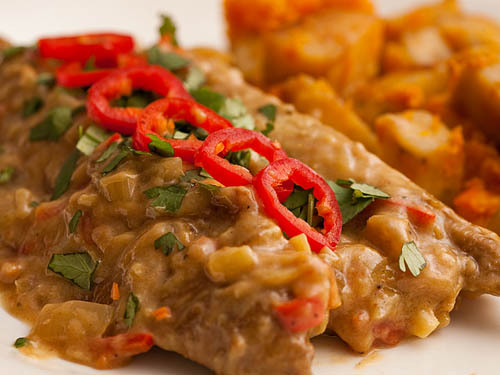 Serve the “chicken” and its gravy with the veggies, garnished with fresh coriander. Makes 3-4 portions. This entry was written on March 22nd, 2011 by Maija Haavisto and filed under Africa, Protein main dishes.